Generally cloudy. Slight chance of a rain shower. High around 60F. Winds E at 5 to 10 mph..
Cloudy skies. Slight chance of a rain shower. Low 49F. Winds ESE at 5 to 10 mph. In the national discussion about America’s relationship with China, the touchy subject of import-export balance is often mislabeled as a “free trade” issue. But if there was one point to be taken from the May 18 session of the Pennsylvania House Manufacturing Caucus, it was that the steel industry’s China problem has little to do with the capitalist ideal of free-market competition. This month’s hearing of Harrisburg’s manufacturing legislative caucus centered around steel, and specifically what can be done to prevent further loss of Pennsylvania’s steelmaking jobs and production capacity to overseas markets. The reality is not much, international trade requirements are a federal issue. But, as the caucus members noted, pressure from below often begets results. “My hope is that the state of Pennsylvania can be a leader in addressing these issues,” said Rep. Eli Evankovich, the caucus chair. There’s no doubt that massive numbers of manufacturing jobs, particularly in steel, have been lost in recent decades, even Donald Trump pointed out last month that Pa.’s manufacturing employment has contracted 35 percent since 2001. The sector still provides about 10 percent of the state’s employment, and about 12 percent of GDP. The steel sub-sector still has about 136,000 jobs in the state, with an average wage of $70,000, according to Bob McAuliffe, Director of United Steel Workers District 10. The loss of jobs is due to replacement by the foreign market, which makes up about 30 percent of steel consumption nationwide. The majority of this material is from China. Chinese steel production capacity is massive — estimated at over 700 million metric tons. The Chinese domestic market can consume less than half of this. Chinese steel overcapacity is estimated at 435 million tons, according to Scott Paul, president of the Alliance for American Manufacturing. US production capacity is a little over 100 million tons. This has resulted in so-called “dumping,” the practice of selling a commodity below production cost as a means of market arbitrage. Doing so is illegal, and the Federal Trade Commission can bar importers found to be doing so. Chinese dumping has gotten to the point where steel is often being sold 30 to 40 percent below its production cost. But the issue is difficult to address because China’s core economic structure defies the concept that most trade is based upon. 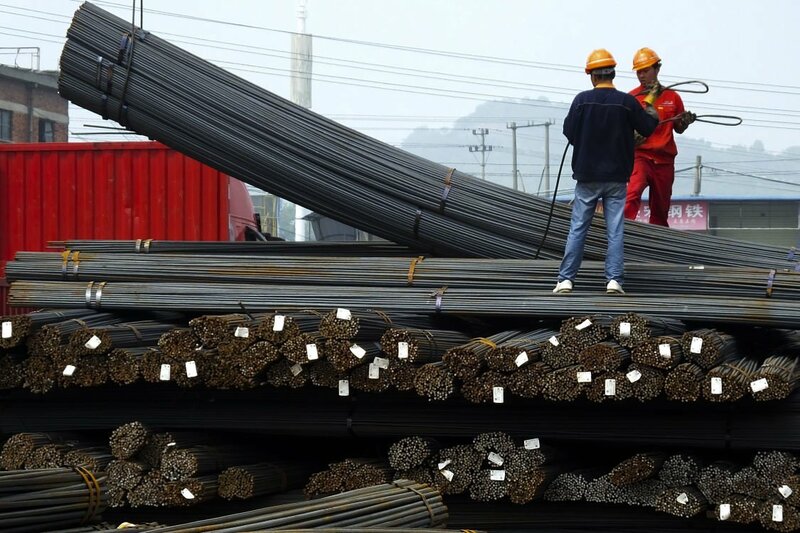 Nine out of 10 Chinese steel companies are government-owned, Paul noted. Even those that are not are typically dependent on financing from banks that are state-controlled. The Communist Party effectively directs all funding in a feedback loop, lending to itself where it sees fit. “This is not the product of market forces, or that US producers are inefficient tor unproductive,” Paul said. Rather, it is a conscious decision by the Chinese government to build economic dominance in a certain sector for geopolitical purposes. The United States exports little to no steel, nearly all of what is made in Pennsylvania and elsewhere is used here in higher-level industries that require tighter domestic quality standards. In a somewhat groundbreaking move, US Steel filed a petition with the FTC last month invoking Section 337 of the Tariff Act of 1930. This allows the federal government to ban imports that may result from intellectual property theft. Allegations have been made that a computer breach at U.S. Steel in 2010 was orchestrated by Chinese hackers to advance their steel-production technology. “My understanding is that a decision to accept the case will come at the end of the month, and then the investigation by the feds takes six to 10 months,” Masciantonio said. The other possible angle of addressing the issue, Masciantonio noted, was by environmental standards. American steel is much more cleanly produced, using exhaust scrubbers, catalysts, and other techniques to eliminate particulate matter and cut carbon emissions to a fraction of what they were even a few years ago. Questions were also raised over the effectiveness of the Trans Pacific Partnership – the Obama administration’s flagship trade deal that has come under fire from both the right and left as potentially worsening the US’s manufacturing losses. For the most part, the steel industry has been fairly ambivalent, as the current outflow of manufacturing will likely continue with or without the TPP. As Paul explained, the TPP doesn’t address issues of currency manipulation, whereby the US suspects China is artificially lowering the peg of the yuan to the US dollar in order to keep exports running. The TPP also does nothing to address the exploitation of a loophole that was created by the last major US trade pact, the North American Free Trade Agreement, or NAFTA. Under the NAFTA system, goods can be labeled as originating in a given country as long as 35 percent of the materials were domestically-produced. The other 65 percent can be from a third party. This allows China to pass off materials, such as steel, by selling them to companies in Mexico or elsewhere. The finished product is then technically Mexican, and subject to favorable NAFTA tariffs, even though it may be 65 percent Chinese. This is part of the reason why direct tariffs on Chinese steel — now at 266 percent — have done little to stop the flow of undervalued goods. “For the steel industry, the benefits of the TPP would not be great,” Paul said.